The increasing WAN demands of branch offices, vast proliferation of devices, constant need for wireless network uptime, together with a desire to keep costs low has left IT with a simple charge – accomplish more with less. To address this, IT must shift from reactive to proactive, from network-centric to user-centric, and from manual to automated. Artificial intelligence (AI) has provided a clear path forward to solve for these challenges and deliver automation to the IT admin. 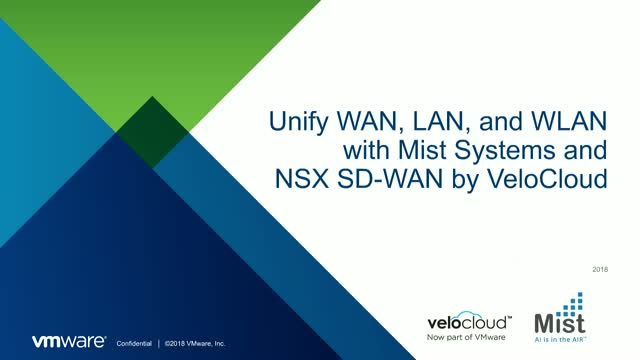 Mist Systems has partnered with VeloCloud, now part of VMware to bring WLAN analytics, AI, and intelligent troubleshooting to NSX SD-WAN. Join us for a joint webinar where the experts from Mist and NSX SD-WAN showcase the power of LAN and WAN integration to give customers unprecedented visibility into their LAN and WAN environments—from the branch to the cloud, and everywhere in between. SD-WAN is changing the way that organizations run their business. The continuum it offers enables new and enhanced offerings to become available that simplify, expand, and optimize all network activity. In this webinar, we’ll explore how SD-WAN architecture provides the flexibility needed to make the necessary enhancements. Which includes enablement of secure transport, expanding bandwidth for multiple applications, video offerings, and enabling sophisticated analytics, all while turning the network into a profit center. Growth technologies of the last several years have laid the foundation for the next wave of digital transformation. The network is no longer just a set of devices, but instead an intelligent service that links together cloud and virtualization functions. Transforming the network directly supports the larger digital transformation. The WAN architecture must evolve to support these increasing demands and become a platform for innovation. SD-WAN has emerged as an integral part of this transformation by providing a robust and agile network with greater visibility and control. In this webinar with AT&T and VMware, hear directly from the experts how to modernize your WAN by embracing a flexible and future-proof approach to managing your WAN and improving the user experience. AT&T SD-WAN PLUS leverages AT&T’s VPN (AVPN), broadband aggregation, and SD-WAN to deliver competitive pricing and value, consolidated invoicing, proactive security and threat detection, and dramatically improved business outcomes. • Discover the advantages of SD-WAN and how it helps drive the next wave of digital transformation. • Learn about how AT&T SD-WAN PLUS employs transport components using VMware SD-WAN by VeloCloud VNF over the top with AT&T FlexWare. • Hear how AT&T SD-WAN PLUS ensures an enterprise-class solution with a cloud-first approach that provides network visibility, along with simplicity and performance assurance. Bob Laliberte, Senior Analyst at ESG Inc.
For many organizations, the wide area network (WAN) infrastructure that connects an enterprise’s remote and branch offices has not changed for decades. However, as application are rapidly moving to the cloud ( SaaS and IaaS), the WAN needs to evolve in response. Bob Laliberte, Senior Analyst with ESG, Inc., will explore the challenges many organizations face with legacy WAN environments, illustrate why a new solution is needed and highlight the business value of rearchitecting with SD-WAN. This will include reviewing customer examples and a TCO model to demonstrate the value to your business. Organizations will learn how SD-WAN provides a combination of pure economic benefits as well as agility and flexibility to help organizations be successful. Managing the wide area network can be a challenge for small business that have limited IT resources. As the use of applications grows organizations need to add bandwidth and connect to the cloud with high performance. They need to ensure that critical traffic like voice is given high priority and that they have tools to ensure performance. In this webinar with AT&T and VMware we will show you how you can improve the quality of your WAN and increase visibility into network performance while reducing the resources that you dedicate to managing your WAN. You will learn how you can access applications from the cloud with ease and get better voice quality for your remote sites. Together, AT&T is offering a cloud-delivered SD-WAN service to all of your business needs. SD-WAN is changing the face of networking, ushering in an era that is not limited by bandwidth, location of data and apps, and hardware. But as the technology becomes more pervasive, so does the amount of SD-WAN options available to those seeking the solution. In this webinar, we’ll take a closer look at the architecture of SD-WAN, why it’s important in the decision process, and the seven key questions that a network organization should ask when evaluating an SD-WAN solution. In this webinar, we go a level deeper into SD-WAN Migration by focusing on its architecture and its ability to adapt to the varied network requirements of global enterprises. Topics will also include best practices and recommendations for a successful SD-WAN transformation for both regional and worldwide deployments. The increased deployment of cloud applications, storage, hosted voice, video, mobile applications, and the emergence of IoT has challenged IT and business managers to provide high-quality WAN services to the branch. Software-defined WAN (SD-WAN) offers compelling advantages for distributed organizations with critical branch operations, including the benefits of business agility, optimized application performance, and increased bandwidth efficiencies. An over-the-top deployment enables a simple and reliable way for users to take advantage of cloud transformation. But making the transition to SD-WAN can seem overwhelming, but in reality, is not as complex as one would imagine. In this webinar, viewers will learn the best practices on how their organizations can adopt SD-WAN at scale without disrupting their existing networks. VMware SD-WAN by VeloCloud helps improve operational efficiency and lowers cost of running a business without compromising on security, with a robust architecture that is uniquely flexible to secure both traffic and data. Join this webinar to learn what options VMware SD-WAN offers to secure customer networks by using built-in security capabilities or by partnering with world class security vendors for cloud-based and on-premise security deployments. VMware SD-WAN by VeloCloud delivers best in class SD-WAN capabilities to deliver reliable branch office network connectivity using commercially available broadband, MPLS or LTE transport. But, security at the edge of remote sites is highly important and having the ability to deliver tight security policies along with SD-WAN capabilities is essential. Join this VMware webinar to learn how our SD-WAN solution acts as a simple security service insertion platform to deliver enterprise-grade security functions like IPS/IDS, stateful firewall and Malware detection using local third-party DIA security engines or cloud-based security engines. De nos jours, la technologie joue un rôle primordial pour servir les patients, mais elle doit être en mesure de respecter systématiquement les réglementations en vigueur du secteur et d'être suffisamment souple pour s'adapter à son évolution. With a vision to expand its offices, increase the number of supported job sites, and migrate critical applications and data to the cloud via Azure and AWS, BGE needed to adopt a new network architecture able to support future growth and opportunities. Rather than continue investing in a costly and inflexible MPLS transport that didn’t support its need for cloud connectivity, BGE sought a modernized technology solution. In this webinar, learn how BGE implemented SD-WAN via its partner, Meriplex Communications, with business changing results. With an ever-increasing amount of enterprise traffic driven by Public Cloud SaaS applications, security has never been more complex. Direct access of applications over the internet, while inexpensive, does not provide Enterprise-grade performance and simultaneously leaves the network susceptible to attacks. Furthermore, the traditional approach to branch connectivity involves a convoluted backhaul of traffic to a centralized firewall located in the corporate HQ or Data Center before accessing the internet. Why does it need to be this complicated? The short answer… it doesn’t. Join this webinar for an overview — and a deep dive — of an integrated approach to wide area networking that combines best-of-breed security and SD-WAN solutions. Experts from Palo Alto Networks and VeloCloud, now part of VMware, will discuss next generation Enterprise WAN and outline an approach that makes it simple to assure the performance and security of applications, dramatically simplify deployments with various options, and cut costs. Huge demand for cloud services means huge demand for wide area network (WAN) connectivity, security, and bandwidth. It has also changed enterprise network architectures and created new challenges for Chief Information Officers (CIOs) and IT managers in charge of building networks and purchasing bandwidth for their company. The need for fast, secure access to cloud applications, demand for services and app agility, and the desire to leverage Internet connectivity is boosting demand for software-defined WAN (SD-WAN), which has more flexibility and better economics than traditional WANs. Tune in as Futuriom Principal Analyst R. Scott Raynovich recaps the findings of its recent SD-WAN Growth Outlook, detailing what’s driving fast adoption for SD-WAN technologies. Networking is in a constant state of change, but the with the advent of cloud and virtualization, the current evolution is altering the way we’ve traditionally understood it. The Virtual Cloud Network is about virtualization, connecting data centers and branches and cloud to each other in a seamless and flexible manner that supports this evolution for the next several decades. The lynchpin to this new architecture is SD-WAN, with its pervasive, scalable, and adaptable framework. The SD-WAN market has been flooded with a range of vendors offering varying types of SD-WAN solutions. While having differing types of solutions provided by numerous suppliers is potentially beneficial, it also creates confusion that complicates the task of evaluating alternative SD-WAN solutions. Join us as Jim Metzler, analyst, researcher and founder at Ashton, Metzler & Associates, cuts through the confusion in the market by identifying seven key questions that network organizations should ask themselves as part of evaluating SD-WAN solutions. In today’s world, undisrupted network connectivity is critical to ensuring business continuity. As the adoption of virtual instances and cloud migration accelerates, dependence on high quality, high speed, high bandwidth connections becomes a necessity. Outages have far reaching implications and can be detrimental to a business as the networks of yesterday are ill-prepared for the business of today and the future. SD-WAN is changing this scenario. In this webinar, Myron Steves discusses how its implementation of SD-WAN transformed their entire network and prepares them for future growth.